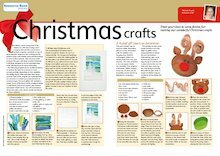 Christmas crafts — invite your children to make a sophisticated card, Rudolph gift box and winter advent village. With activities and templates . Rock Around The Shops — teach your children this rousing Christmas song. With activities and resources .